I have been incredibly impressed with this whole experience. Highgate House, and all the lovely people I have had the pleasure of dealing with, have been nothing short of first class. Even your delivery Contractors are a standout, showing impeccable etiquette. The quality of the items, the Creative minds, and the business service have all been outstanding and I very much look forward to coming back to Highgate House again soon. As soon as I saw images of interiors by Highgate House, I knew this was who I wanted to furnish and decorate my formal living room. 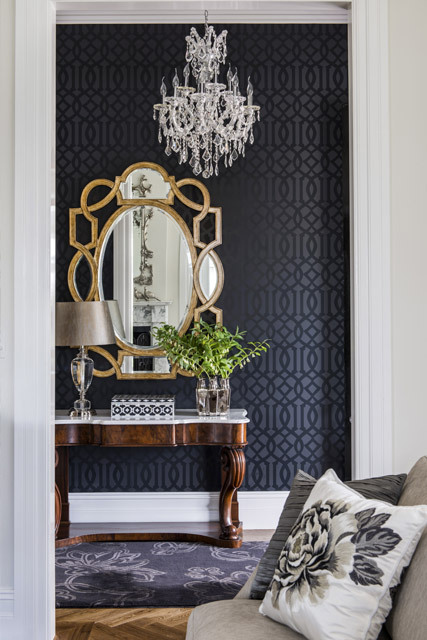 To me, they are unique in their ability to create a deeply layered look that avoids being contrived by incorporating many different elements in a beautifully curated way. There is so much to keep the eye interested, yet it all comes together as one cohesive space. My living room is no exception. It is a delight to retreat into this peaceful space alone or to fill it with friends and family who find it a place where they want to linger and just ‘be’. I know this will be a space in which many significant moments and memorable conversations with family and friends will take place. Leigh and Polly were also incredibly personable and a pleasure to work with. I can’t imagine making any major decisions about my home in the future without consulting Leigh and her team. Leigh was able to understand and work with my taste, the constraints of my home and some minor aspects I was particular about, without compromising her creativity or design standards. She is at once diplomatic and brutally honest in a way that is respectful and engenders trust. She and Polly transformed my initial ideas for the room and took it to another level. They challenged my comfort zone when making decisions about my home and created a space I absolutely love. We have been very happy clients of Highgate House for over 10 years. Leigh and Pat are such a pleasure to deal with. What we particularly love about their work is how they incorporate our ideas and preferences – we very much appreciate their expertise and clever design, yet at the same time we know that our home is individual and represents us. We cannot recommend them and their fabulous work highly enough. I have worked with Leigh Boswell and Highgate House for just over three years and my home is the true testimonial to Leigh’s knowledge and professionalism. Our home interior has featured in House and Garden and our Master Ensuite won the HIA , Bathroom of the Year award also featuring in Kitchens and Bathrooms Quarterly all thanks to Leigh knowing her customers, being intuitive to what they love and she designs rooms that truly reflect the people who live in them. I have always known what I like, but Leigh and her team guide you through the maze of many choices to be made and enlightens you to what the market has to offer. Leigh and her team work with such class and professionalism and it has been a pleasure, an ongoing pleasure to continue working Leigh and her team at Highgate House. We have engaged Leigh to undertake a number of decorating projects for us over the last 5 years. We have always been impressed with her natural flare, practical skills and professionalism. Leigh has always taken the time to consider our individual taste, needs and budget in her designs and we have always been very happy with the results. Leigh is a pleasure to deal with, and we have recommended her to many friends. Having admired the look of professionally decorated homes I had always wanted to use a designer but was unsure of the process or if the outcome would meet my exceedingly high expectations. I wanted a home that flowed, that was stylish but individual and that had spaces that were elegantly decorated but functional.Yes a huge task! Luckily for me,Leigh and her team at Highgate house surpassed all my expectations , they guided me through the process and delivered more than a service it was a delightful experience with sensational results. So wonderful was the make over of my lounge and dinning rooms that now all the rooms have had the Highgate House touch. Originally Leigh designed a lounge and coffee table and had them made to complement the existing dinning furniture. Like icing on a cake the room was dressed with magnificent cushions, rugs,throws, lamps and a mixture of existing and new accessories. She also revamped our art collection reframing some works to complement the space and planned the layout to exhibit them so our favorite works could be enjoyed. Once the furniture was placed,rooms were dressed and works rehung the reveal was amazing. Leigh complemented our taste and designed the room I wanted but could never have achieved without her. More than ten years on from those first rooms and many more completed and I know the secret to design success is choosing the right designer and listening to their advice.This coupled with planning-balancing what you want with your budget and letting the designer know what that budget is allows them to source the right products for you. There is no compromise on quality or style at Highgate House. Every project has been a fantastic experience, exciting from the first meeting…the results sublime. bring to every project is reflected in the magnificent results.